Sunnyvale, California — March 8, 2017 — Today Diamond Systems, a leading global supplier of compact, rugged, I/O-rich embedded computing solutions for real-world applications in a broad range of markets, unveiled VENUS™, believed to be the very first rugged small form factor single-board-computer (SBC) based on the Intel “Skylake” 6th Generation Core i7/i5 processor. Venus offers the highest available CPU performance in a small form factor rugged SBC with modest power consumption. Venus features DDR4 memory soldered on board, bottom side conduction cooling, two PCIe Minicard sockets, in the 3.5” embedded form factor. Venus is available in two models, the high performance 2.6GHz i7 version (VNS766-4GD) and a lower cost 2.4GHz i5 model (VNS563-4GD). The wide range of I/O functionality included on Venus meets a majority of today’s embedded computing connectivity requirements. 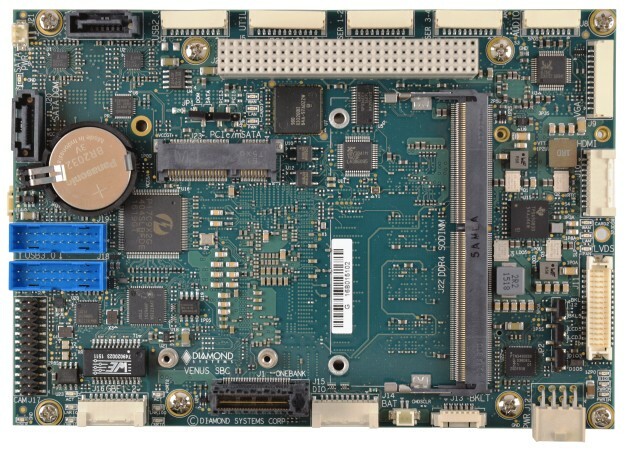 The board includes 6 USB 2.0/3.0 ports, 4 RS-232/422/485 serial ports, 16 digital I/O lines, two Gigabit Ethernet ports, HDA audio, Camera interface, and TPM support. Venus supports three simultaneous independent displays consisting of VGA, HDMI, and LVDS LCD; all three displays are 4K capable. 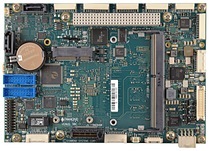 For additional I/O needs, the board includes a PCIe/104 OneBank Plus socket (PCIe/104 and PCI-104 expansion) with support for up to 4 I/O modules. Venus also supports two MiniCard sockets; The top side socket supports full-size PCIe and USB minicards along with mSATA disk modules, while the bottom side socket supports full and half size PCIe minicards. Mass storage options include SATA DOM, mSATA, and a connector for an external SATA drive (all ports are SATA III capable). The wide range 9-18V input voltage provides additional flexibility. Venus incorporates a full suite of rugged features such as soldered memory, latching connectors, and a thicker PCB, making it suitable for the most demanding vehicle applications. The 4GB soldered memory may be upgraded to as high as 20GB using Diamond’s unique RSODIMM™ rugged memory modules, which are designed to withstand MIL-STD-202G shock and vibration specifications. Standard DDR4 SODIMM modules may also be used. The bottom side heat spreader provides the most efficient cooling solution in a weight-optimized design, enabling Venus to run reliably at up to 85oC (lower operating limit is -40oC). Venus is the latest addition to Diamond’s Raptor™ rugged computer systems that offer MIL-DTL-38999 connectors, MIL-STD-202G shock/vibration conformance, MIL-STD-461 compliance, and IP67 environmental rating. These systems can be customized to include additional I/O boards and storage media, as well as customer-specific connector arrangements. Shipments are expected to begin in May 2017, with early evaluation units available now. Complete Development Kits for Windows 10 and Linux, including the fully configured SBC and a complete cable kit, are also available to simplify application development effort. Contact Diamond Systems at sales@diamondsystems.com for quantity pricing and customization options. Founded in 1989, Diamond Systems Corporation designs and manufactures compact, rugged, board- and system-level real world embedded computing solutions in a broad range of markets, including transportation, energy, aerospace, defense, manufacturing, medical equipment, industrial controls, and research. Diamond’s products are designed and engineered to operate in rugged environments with wide temperature ranges, –40°C to +85°C, and at high levels of shock and vibration. Their solutions include single-board computers (SBCs); expansion modules for analog and digital I/O, wired and wireless communications, GPS, solid-state disk, and power supply functions; and complete system-level solutions. For further information, please visit www.diamondsystems.com or call +1-800-367-2104 (USA).